Numerus Clausus II is a gourmet / formal restaurant offering Mediterranean cuisine. The average price of a main course dish at the Numerus Clausus II restaurant is 14 euros. The average price of a 3-course meal at the Numerus Clausus II restaurant is 30 euros. Note that although GoMadrid.com strives to maintain all information about Numerus Clausus II up to date, the prices mentioned are only an indication and may not reflect the exact value of your meal. In the Madrid of the future, next door to Telefónica and Telecinco's Ciudad de Comunicaciones, the Numerus Clausus opens its doors with a daily bill of fare featuring traditional, home-cooked meals, making it one of the area's most classic restaurants. It's open Monday to Friday. 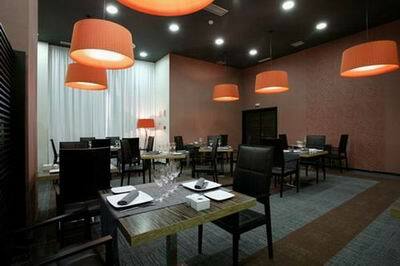 The address of the Numerus Clausus II restaurant is: C/Maria Tubau, 16, Hotel High Tech Nueva Castellana, 28050 Madrid. The nearest Metro station is Las Tablas. Please see the Numerus Clausus II restaurant location map below.